Ovation Horse Products & Ovation Brand Equestrian Clothing at Tack Warehouse in Woodland California. Tack Warehouse has the BEST Selection and Price! The focus is on comfort- for the wider calf! The Flex Plus™ Field Boot is designed with 2 stretchable leather gussets on either side of the zipper to accommodate the wide and extra wide calf. Crafted from fine, long wearing full grain calf. Fully lined with vegetable tanned leather that molds to your leg and adds to the custom touches of this fine boot. Soft Flex™ inset adds a new dimension of comfort, flexibility to the ankle and immediate break-in. Featuring elastic laces, stretch panels, back zipper, and a classic ripple sole for security and elegance in the irons. Woven polyester fabric and machine washable. 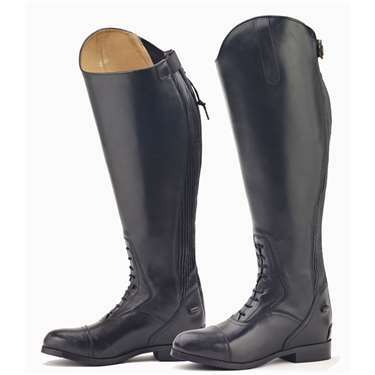 The Ovation® Ladies Dressage Shadbelly is beautifully tailored and easy to care for. Lined tails, gold points. Wide round raised crank noseband double bridle featuring a special padded European style Comfort Crown design, 5/8" leather reins with stops, and 1/2" leather curb reins. Deisgned in Germany and built from the finest leathers in our own workrooms, the EUROPA collection allows us to bring the prices for authentic German styling and sizing down to earth. Riders asked, Ovation(R) delivered! Quality leather contoured monoflap saddle girth with extended bellyguard panel, and d-ring, buckled martingale loop, double elastic on both ends, and roller buckles. The Recessed Crown System is designed to alleviate unwanted pressure on the sensitive poll area of the horse. The RCS design allows the caveson strap to pass over the crown in a recessed channel with only soft padding touching the horse. The RCS Wide Padded Nose Bridle is crafted in rich and supple Italian leather, and features fancy stitching on the wide-nose caveson and browband, and fancy stitched raised laced reins. The Recessed Crown System is designed to alleviate unwanted pressure on the sensitive poll area of the horse. The RCS design allows the caveson strap to pass over the crown in a recessed channel with only soft padding touching the horse. The RCS Jumper Bridle is crafted in rich and supple Italian leather, and features fancy stitching on the caveson and browband, geniune sheepskin disk, and rubber reins. Buckle ends. Contoured padded Comfort Crown, curved browband designed to lay flat against the head and inlaid with clear crystals, wide leather crank cavesson, 5/8" rubber lined leather reins, and 1/2" flat curb reins. Deisgned in Germany and built from the finest leathers in our own workrooms, the EUROPA collection allows us to bring the prices for authentic German styling and sizing down to earth. Riders asked, Ovation(R) delivered! Wicket and Craig American leather is known for its rich color and willingness to take oil. Our Dark Brown Leather collection is accented with champagne colored stitching, enhancing its overall beauty. Genuine sheepskin disks and elastic for added comfort and freedom of movement.